It doesn’t matter that he turned 86 years old today. As always, he bounded out of bed long before dawn. Pushups. Situps. Stretch. Go. Go. Go. There were people needing his help, lessons to be given, talking to be done. Always, talking to be done. He was Nick Bollettieri. Correction: He is Nick Bollettieri, tennis’ non-stop whirligig of energy, ideas and, most of all, engagement. He is the coach who’s worked with ten players who’ve been number one in the world, thousands more of various skill levels, the creator of the revolutionary tennis academy concept – these the most notable of the accomplishments that in 2014 earned him a spot in the International Tennis Hall of Fame. Bollettieri is yet another case study of tennis’ penchant for attracting strong personalities, solo acts who won’t be tamed by the corporate, the institutional, the establishment. He’d been a paratrooper and a law student. But by the time he was in his late 20s, Bolletteri had cast his lot in tennis – and done so in his own way. There were no significant playing credentials in his portfolio. It didn’t matter. Bollettieri’s genius was his ability to connect with people, to find ways to both learn from the greats – no matter their age, size, place, gender – and bring those ideas to his heart and head. In the ‘60s, one of his more notable students was a hardworking boy from Florida named Brian Gottfried. Gottfried would go on to be ranked number three in the world. In the ‘70s, Bollettieri met a teenaged boy, Jimmy Arias, who struck the forehand in a way that was bold, dynamic and powerful. The light bulb lit: This, said Bollettieri, was the shape of things to come. Around that time came the start of his academy. Soon enough, the cascade of future pros – Paul Annacone, Aaron Krickstein, Carling Bassett, Kathy Horvath, Anne White, Jim Courier, David Wheaton, Andre Agassi, Monica Seles and Maria Sharapova among the more prominent who’ve gained from Bollettieri’s wisdom. 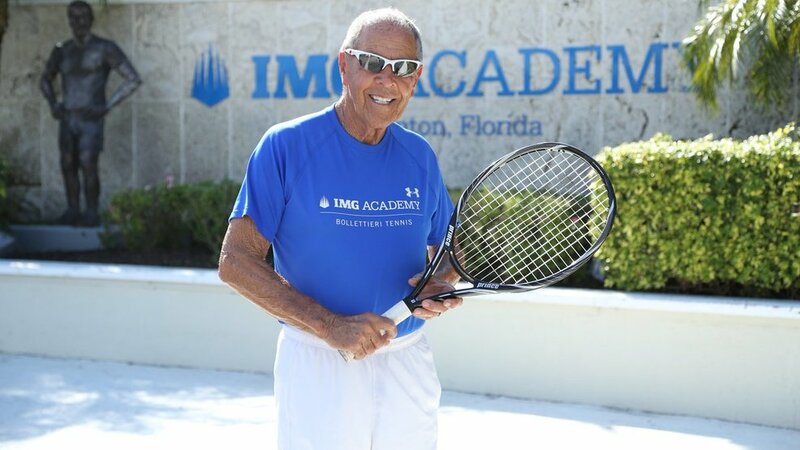 Bollettieri is at once coach, friend, advocate, schmoozer. He lives for the chance to shake a hand, tap a shoulder, embrace his past students while welcoming new ones. “Oh boy,” he’ll say about an upcoming match, at which point he’ll break it down, examining the tactical, technical and emotional interplay between both players. If you can’t get excited about tennis when talking with Bollettieri, please leave the sport.